Wrexham's former police station could be listed, threatening plans to build a supermarket on the site. 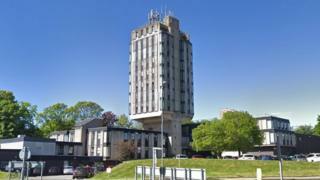 The 10-storey concrete tower, built in the 1970s, is being considered for protection by heritage authority Cadw. North Wales Police opened a new divisional headquarters in Llay and a new station for Wrexham is being built. Police commissioner Arfon Jones said police spending could be hit if the old station cannot be sold and demolished. Supermarket chain Lidl wants to knock down the complex at Bodhyfryd, which closed in January, and build a store with a drive-through coffee shop. However, the clock is ticking as officials from Cadw prepare to assess the high-rise property with the existing planning permission for its demolition set to lapse in June. Mr Jones told the Local Democracy Reporting Service the building was no longer fit for purpose and was surplus to requirements. "The sale of the site is conditional on Lidl obtaining planning permission to build a supermarket there but that cannot happen unless the current building can be demolished," he said. "The loss of the proceeds of the sale could have a direct impact on the policing service in north Wales." The commissioner and his chief constable Carl Foulkes have written to the Welsh Government seeking clarity on the possible listing. A spokesman for Lidl said: "Our planning application has been submitted and we are working with the local authority to progress this application. "We're looking forward to a decision being made in due course." A spokesperson for Wrexham County Borough Council said it was aware of Cadw's interest but had yet to receive any official confirmation of its decision.